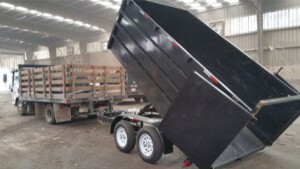 This was not regular junk, this was heavy, heavy junk and required the use of our hydraulic dump trailer. Our customer had rented this unit for a couple of years paying rent to store items that were literally useless to them. What do you think we charged for the storage unit clean out and haul away? 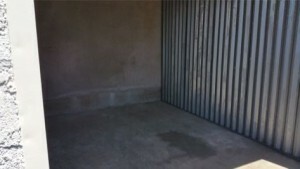 We cleaned out this unit for 1.5 times the monthly rental and the customer was very happy. It was filled with heavy solid core doors, the steel door jambs and lots of boxes of office supplies. We recycled the steel door jambs and boxes of office supplies. 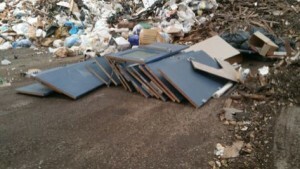 We brought the doors to Edco, here it will get sorted for recycling or proper disposal. 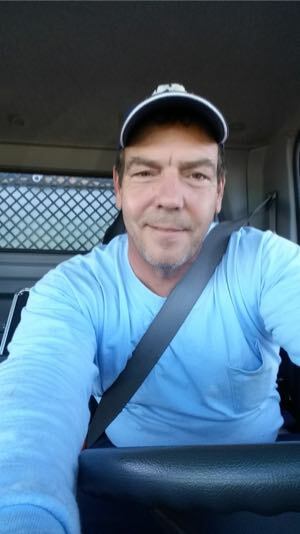 How Much Does Storage Unit Clean Out Cost? The load of doors was heavy and weighed 1.5 tons. 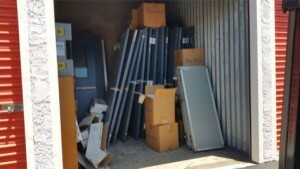 We recycled 560 lbs of steel door jams and donated five boxes of office supplies.